Sitting Pretty: Is It Really Best Avoided? Sitting, Smoking, Sandwiches. Is nothing safe anymore? 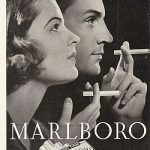 It’s enough to make you reach for a Marlboro, for which, in a rather ironic twist of fate, you have to stand up and walk outside, in order to smoke. I really do think that we need more than a vague idea of the evils of sitting before we demonise it this much and worry ourselves into early graves. So why is sitting so bad for us? Initially I went to the gold standard of Clinical Research, the Cochrane Review Board. These amazing scientists provide an amazing facility for the rest of us: they sift through the entire body of research on a chosen topic and amass all the data, weigh it up in terms of quality, and provide an overall answer to a particular question based on the pooled results of all of the pooled data. So I went simple, the NHS website. It has a few choice paragraphs about this very topic. We all know need to be more active, but there is increasing evidence that we also need to spend less time sitting down. To reduce our risk of ill health from inactivity, we are advised to exercise regularly – at least 150 minutes a week – and reduce sitting time. Studies have linked excessive sitting with being overweight and obese, type 2 diabetes, some types of cancer and early death. Sitting for long periods is thought to slow the metabolism, which affects the body’s ability to regulate blood sugar, blood pressure and break down body fat. Many adults in the UK spend more than seven hours a day sitting or lying, and this typically increases with age to 10 hours or more. This includes watching TV, using a computer, reading, doing homework, travelling by car, bus or train but does not include sleeping. The Start Active, Stay Active report recommends breaking up long periods of sitting time with “shorter bouts of activity for just one to two minutes”. A panel of leading experts ,chaired by Professor Stuart Biddle, who reviewed the evidence on sitting for the report recommended taking “an active break from sitting every 30 minutes”. However, there is currently not enough evidence to set a time limit on how much time people should sit each day. Nevertheless, some countries – such as Australia, the US and Finland – have made recommendations that children limit screen time, such as TV and video games, to just one to two hours a day. Recent research has suggested that exercising at least 60 minutes a day can offset the negative effects of sitting down too much throughout the day. The link between illness and sitting first emerged in the 1950s, when researchers found London bus drivers were twice as likely to have heart attacks as their bus conductor colleagues. There has been an explosion of research on the ills of sitting in the past few years, prompted by our increasingly sedentary lifestyles. It is thought excessive sitting slows the metabolism – which affects our ability to regulate blood sugar and blood pressure, and metabolise fat – and may cause weaker muscles and bones. “Essentially, the body is ‘shutting down’ while sitting and there is little muscle activity,” says Professor Biddle. Research on astronauts in the early 70s found life in zero gravity was linked with accelerated bone and muscle loss and ageing. “Sitting for an extended period of time is thought to stimulate, albeit to a lesser degree, the effects of weightlessness on astronauts,” says Professor Biddle. This is über Vague and Start Active Stay Active, which is referenced here was published in 2011 – in research terms that is a long time ago . No one really seems to know, definitively, why sitting is bad and how long is too long. Remind you of anything? Like, perhaps , dietary advice?! The research on NASA astronauts suggests that on their return from space, even light walking was effective in overcoming the negative effects of weightlessness. “Breaking up sitting time engages your muscles and bones, and gives all our bodily functions a boost – a bit like revving a car’s engine,” says Professor Dunstan. With all due respect to Professor Dunstan, I want to know what to do based on the lives of, let me see….how about….A woman living in the UK, who is middle aged and not a goddamn astronaut…! That is a really big deal because many of us sit to work, to commute, to study and to chill out or socialise. That is a lot of sitting and it’s terrible that this activity has been so demonised without really clear facts as to why it is so bad. So, sitting bad, ten thousand steps good, right? What of the evidence base for 10,000 steps being a good idea? There isn’t much. It’s just a trend. Crucially, aiming for the magic 10,000 might cause you to omit, forget or avoid all the other good stuff that you could and should to help your body which doesn’t involve walking. Movement such as spine articulation – rotation, side bending and curling, shoulder movements to take the arms away from the “lived in” position of just in front of the body, squatting and lunging to move the hip/ankle and knee joints and to work the muscles of the lower body. It is unattainable for some and therefore could be counterproductive – overwhelming and off putting if you are very sedentary. As ever, everything is so all or nothing with the portrayal of movement in the media, as if one size fits all. Bite size chunks might be far better for many of us. 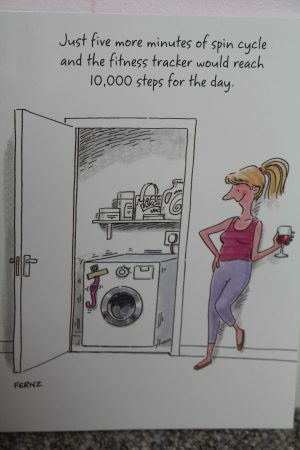 If you do 1,000 steps now, then aim for 2,000 etc. And if wearable tech is not on your radar, or, if you don’t have a smart phone, why not just measure in minutes? Do you remember a time when that was perfectly reasonable? The mere fact of measuring in steps will put off people who lack the gadgetry. It could be another barrier to exercise. As if there weren’t enough already. Is sitting too much bad for you, or is the absence of movement bad for you? This is a very important difference and it really matters. Sitting too much and an absence of movement are not the same thing. You can ameliorate the effects of sitting too much by not sitting but you can only ameliorate the absence of movement by moving in more varied ways, with the whole body, in a way that creates strength in the muscles and sustains mobility in the joints. The evidence base for sitting being bad for your health is iffy, however, on balance, sitting for prolonged periods is probably a bad thing. So what I’d like to do is to mention a few reasons why, specifically, sitting too much is best avoided. There are natural alternatives to standing: squatting low to the floor – like toddlers to when they first learn to walk, or sitting cross legged in a “long sit” and lying down to sleep and of course humans should be sleeping for around one third of every day. Sitting is less supportive for when we bend, lean and reach. The forces through the back are greater than when we are standing up and moving the arms/head/trunk. It’s not so much that we shouldn’t sit, but more that we should take care to optimise our posture when sitting, particularly in an office based job. This the one that I wonder about the most. There is no evidence base. It is just my thoughts. Very many people are tight in the pelvis. By that I mean, that the muscles that cross the pelvis are tight. The hamstrings, the gluteals at the back, the hip flexors at the front, the inner thighs in the middle and the back muscles in the trunk, They prevent the pelvis from moving correctly when we walk. If you can’t move your pelvis properly to “send” your thighs forwards and back, then gait is disrupted and the pelvis twists , turns , hitches and rolls when you walk. If you take a look at the way people walk then it is a very common sight. It is not a good thing and it is not remedied by merely walking, although that helps because any movement is better than none at all. The muscles need to be stretched out, foam rolled, massaged and moved. 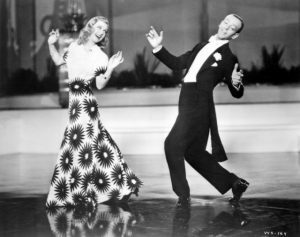 And, or, get out your dancing shoes! 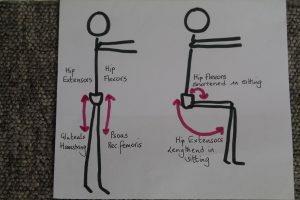 If you sit a lot then this necessarily requires the body to shorten at the front and get longer at the back so as to be able to bend at the hip . Ironically, they are held long but can still be tight because they are remain in one position for long periods. They likewise lack strength through range which is critical for normal, varied human movement. Sitting chronically weakens the gluteal muscles – the ones in your buttocks. It is hard to comprehend if you are under the age of about 60 but believe me, if you meet older adults who increasingly struggle to stand, walk and stair climb, then you’d see that it is a very real problem for people and potentially for millions of us as we get older. And by older, in this context, I mean 80 +. However, even younger people can struggle to squat or pick stuff off the floor because of joint tightness and muscle weakness. What to do? Well, walking really does help here. As does running, squatting, lunging, stair climbing. Does Sitting Have an Effect on Breathing? This is a bit of a wild card. 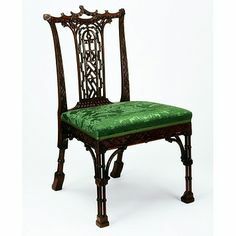 It’s not so much the sitting that is the issue, but the tendency we have to slightly slump forwards and with a rounded spine. This position is not conducive to efficient breathing. For that you need the spine straight and the breast bone forwards so that the ribs can expand out with each in-breath. If the body is rounding forwards, aided and abetted by gravity, then the breathing muscles have to work harder to over come the slump to get the ribcage to open. How to motivate ourselves to actually do it? There is very little that I do standing up. Gardening is one of the few pursuits. I don’t walk for pleasure but if I was planning to move more then my first choices would definitely walking and cycling. 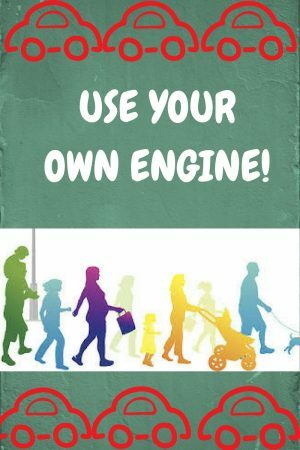 I try to make short journeys using my own engine, so to speak, but find that I use the car not out of laziness but to save time. There is something silent and hidden about the problems of sitting. It doesn’t feel bad does it? It feels pleasant, or you don’t notice it at all because you are preoccupied with whatever task you are carrying out. I have tried my best to build movement into my daily life. I do some regular exercise most but not every day. I’m fortunate that my job keeps me fairly active and exercise is of such immense benefit to my mental health that this alone keeps me disciplined and on task. On the other hand, I no longer do 8-10 school runs per day and walk far less compared to when I was unable to drive. Prior to gaining a driving license I had little choice but to be walking here there and everywhere. It feels a bit like eating healthily. Keeping moving, especially in varied ways needs constant attention and planning and maybe even considered as a daily habit rather than an occasional pursuit.